I often hear that a longbow man required years of training in order to become proficient in his trade. Precisely why is this? Is the training simply about building the endurance to fire shots over and over again, or is there something else to it? Or instead, is the "years of training" simply keeping his skills "in shape"? It also takes lots and lots of practice to get consistently accurate with a bow. Any joker can grab a bow and put an arrow on a target, but to do so with a high draw-weight at any range and do so consistently? There is also the endurance aspect. Go down to your local archery range and try to draw a bow of higher poundage than you are used to. Your arms will shake and even if you manage to get it to a full draw, you will have trouble holding the bow steady for long. Over time, though, you'll build the muscle memory and mass to be able to use that heavier bow more effectively and for longer. It does take time to get good at archery. Being able to draw the bow is only a small part of it. It takes lot of practice to be able to shoot consistently. That would be the part that would take years to master. it also requires fairly constant training. If I take a couple month break from shooting my longbow (moving, winter, what ever) It takes a couple of practice sessions to get back to were I was before I quit, let alone before I can start getting better. As for how long it can take to build up to shooting a true English war bow. Well I had a sudden itch to get one. I'll let you know how long it takes me to be able to shoot a 120 -140lb bow repeatedly. I'm hoping, with a little determination to be able to do it for next years archery practices, which start in 3-4 months. Now to find out where to get arrows spined for a bow that powerful. The heavy draw weight of medieval war bows was a big part of it. The average draw on the Mary Rose bows was 150 lbs, and today there are only a few dozen Westerners who can use big bows like that consistently. There was a lot of resistance in English archery circles when that figure came out. Several of the skeletons at the Towton grave showed signs of the bodies adaptation to the stress of archery with powerful bows. The bones of the shoulder and arms joints showed enlargement consistent with what would be expected from the stresses of high draw weight bows. Practicing long enough to cause the bones to adapt takes quite a while and is ultimately helpful to ones archery. i can't find the ordinance, but during the war of the roses it was law for men to train with longbow after church. Edward III ordered such as well. It was fairly standard for Kings to reissue it as well. Henry IV and Hnery V do. Henry V does so right after Agincourt claiming that the arrows of the bowmen adn God gave the English the victory... so back to the butts! I'd say the training is the key for strength and use. Longbows do not have sights so the feel is required on how to get the arrows where you want them. That said some archers are amazing after little time. I'd guess that strength wise an average adult could get to 90-100 in a few years of decent training without killing themselves. Unless you're shooting a bow close to 100lb already, you won't get a 120lb bow to full draw easily or quickly; and 140lb will stop you dead. It should be pretty straightforward for an adult man to draw 100lb. I would estimate each 5lb increase over 100lb takes about 6 months to a year, before you're fully on top of the bow again. So expect to take 3 - 4 years to get up to 140lb, NOT 3 - 4 months. Doing it any quicker and you risk serious wrist, elbow and shoulder injuries as your tendons will not have had time to develop to take the increased load. Your muscles will develop far quicker but that leads most people into a false sense of security. I've seen it far too many times. That's one of the reasons why English archers trained for so long. Rather than draw weight, focus on performance. With a decent 100lb war bow you should be able to shoot a military arrow (1/2" shaft, around 70g, 7" fletchings) about 200 yards. Until your can consistently achieve that, there's no point going up in bow weight. In fact, it's likely that your heavier bow will give you even less range, because you're even less on top of it. 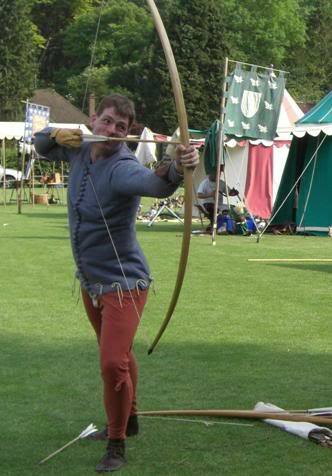 Shooting the English warbow is not like any other form of archery; including the Victorian (recreational) longbow. It requires a VERY different technique that takes years to master. If you're really into the English warbow I would recommended joining the English Warbow Society (EWBS) at www.englishwarbowsociety.co.uk Members will be able to give you advice on training regimes, equipment supplies and technique. I would really be quite happy if I could get up to shooting a 100+ lb bow. shooting a 140lb bow is more of a long time goal. The plan to work up to 140 lb was kind of a spur of the moment idea. After thinking about it, and pesky reality setting in, came up with new plan. Working out for a the summer and getting an ELB based on that. Then keep working out till I can pull a bow weight that I want. Going to take it carefully, no point in buying a bow I can't pull, or that I struggle with and end up sending arrow 100 yards down range in a random direction. gotta have proper respect for a super high power bow. That and don't want to pull/break muscles or tendons. Besides building up shooting strength should help my accuracy. Should be easy to shoot my current bow so I can considerate on the form instead of pulling the bow. Power with out accuracy is worth less. Well placed shot is FAR better than a powerful miss. Ah, of course I would forget the training required to associate angles with distances; thanks. I would try to do bent over dumbbell rows at a gym and see where you peak out at: 80 - 100 - 120 - 140 or more pounds and also find at what weight you can get 8 to 12 reps.
Great way to built up your strength and doing it on both sides of your body sort of prevent developing one arm over the other, that might not make a difference as far as shooting a bow is concerned but it is usually not a good idea to have unbalanced strength differential left versus right side of the body i.e. back or shoulder/posture problems maybe ? Jean is correct: weight training can help; but not as much as you would imagine. Many believe drawing a heavy bow is simply a matter of getting stronger; and that your bow weight is directly proportional to how much you can bench-press. In practice, technique is worth far more than brute strength. I've known self-proclaimed strong, fit guys, who work out regularly at the gym who can barely draw a 65lb bow. My wife regularly shoots more than that! Master Bowyer Steve Stratton, despite weighing no more than 160lb himself, regularly shoots 120lb bows - and accurately. Bottom line: there's no substitute for practice. In particular, there's no gym exercise (I know of) that can prepare the body for the sudden release of load when an arrow leaves a heavy bow. That's a shock load to your system that your body's never really experienced before (and it can HURT!). That can only be (sensibly) achieved by actually shooting arrows. Final thing (on this post). Make sure your bow is tillered to at least 32". Drawing 'to the ear' is, in fact, drawing until your right elbow (assuming a right-hand archer) is in line with the right shoulder - what we call 'locked-in'. Imagine your arm acting like an over-centre catch. Once locked-in, the weight of the bow is transferred to your skeleton and not held on the muscles, giving you far better control and stability. It's known as drawing to the ear because your right hand ends up just below and behind your right ear for most people (actually, somewhere near your right shoulder). For a typical adult man (say 5' 10"), that translates to an arrow length of about 31.5" - 32"). Please note: many archers believe they already have a 32" (or more) draw length. With a war bow the entire length of the arrow is drawn; so that the head touches, or even rests on, the bow hand. This is because any arrow hanging outside the bow is 'dead weight' and contributes nothing to the power of the bow. Having 6" of arrow stuck out the end of the bow will do nothing for your technique or your distances! agreed. most of the pull from a high lb bow comes from the shoulder and back. even the legs. if you watch a pro archer or a re creationist that shoots a high powered one, you will see them make this odd shape out of their body when they both draw and roll fwd when they release. This is me shooting a heavy bow. Note the drawing hand by the shoulder, the arch of the back (to utilise the strong lateral muscle groups) and the grounding through the rear leg. Seconded. I have always been the skinny little shrimp, more so in my youth. Once I picked up someone's 65 lb bow and he told me straight up I couldn't pull it. I did it without much effort and held it (wasn't compound). Makes me wonder exactly which muscles are used in drawing a bow, which ones are used to stablize them, etc. I know I could barely bench 90 lb around that time period. Huh. The whole-body thing makes sense, but I've never seen it before. The "lateral muscle groups", eh? (Looks around for his A&P textbook.) Learn something new every day, maybe every time I check these forums. There are two aspects for longbow training. The accuracy part and the strength part. with a few weeks or consistent practice. The latter is representative of an army marching at you in close formation. In that instance you just need to get your arrows to land anywhere in that mass of people. As far as draw-weights, most men can train themselves up to pulling 110 lb bows. You will get there much faster and safer by building your strength up with modern weight training methods. In addition to the normal bentover rows and pullups for upperback strengthening, I do a special exercise where simulate the pulling of a bowstring with a cable. You brace up against the frame of the machine with one hand while pulling back with the other to just under the ear. It does wonders for developing the rear-delts. Regarding the bone-spurs and calcium build ups that were mention on the Mary Rose skeletons, this is perfectly normal for the body and this happens with even regular strength training. The difference is that when we weight train, we normally develop the whole body evenly. You don't do just one side which would cause a bone build up just there make you look deformed. People who weight train normally look proportioned in their bone structure. Medieval archers favored pulling back on the side of their dominate eye and only using that side. Most archers shoot just with their eye dominant side today too. I have always alternating arms. It especially helps with heavy bows and it keeps me shooting longer and better as I rotate the use of muscles. Sorry, that should be the Latissimus dorsi muscles. Vassilis is quite right about the training aspects: strength and accuracy. For a military archer 'strong shooting' seemed to be favoured. That is, shooting a heavy arrow a long way. But we must assume accuracy at distance is also a factor. Curiously, I have always found that heavy bows don't feel 'right' shooting at close distance. They're no more or less accurate than any other primitive bow at short range but it always feels more comfortable shooting targets at longer distances (100 yards +). Maybe that's just me. I don't think it is just you. Nick A. was saying something almost the same except he had two prefered ranges. 0-50 yards and then 100 on. Interesting but makes sense some. If such distances were not needed then you could have used a smaller bow. If such distances were not needed then you could have used a smaller bow.